At some point, we have all thought of training for a “Gran Fondo”. The idea of racing with your friends and thousands more in breathtaking scenery sounds like a brilliant plan. But without the necessary training, the Gran Fondo can turn into a nightmare without the adequate preparation. We will list the 10 best tips to get yourself into the best shape possible for your big day. In today’s world, the term “Gran Fondo” is usually allocated to races between 60-200km in length. There are many alternatives, but we will be giving you tips to prepare for a Gran Fondo race of between 100-120km. We cannot stress enough that any training plan for a Gran fondo needs to be prepared by a professional. Without the help of a qualified personal trainer, it will be very difficult to reach perfect form in time for the big day. Below we will explain which steps to take. If you do not have any form of training behind you, then to start, the first rides should be low to medium intensity, where distance should be the main goal, and not intensity. This way we can work the aerobic base and good muscular foundations to be able to work at higher and shorter intensity levels. This should be a goal for the first 6-8 weeks of training, at a minimum of 3 days per week. 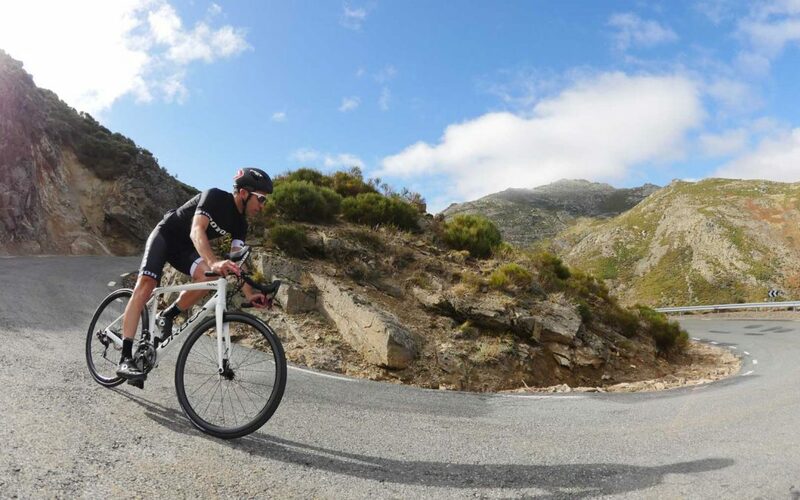 It is important to work on this base to condition the body and fine tune your riding position on your bike, including finding more ergonomic and comfortable parts like handlebars, saddles and bar tape, to make you feel as comfortable as possible during long distance rides. Training twice a week will not be sufficient. The minimum number of days per week should be 3, alternating especially during the start of the training program. The ideal amount would be 5-6 days, These can be used for gym work, where we can work on a good aerobic base, focusing on flexibility, muscle coordination, strengthening joints, increasing power and strengthening the abdominal wall, back and shoulders, fundamental for a correct riding position. 3.LEARN TO CLIMB LIKE A PROFESSIONAL. If you are not an accomplished climber, then it is very likely that during the ascent of a mountain pass you will be left behind, losing the group you are cycling with and ending up alone or in smaller slower groups. During the training for ascending or climbing, look for a hill with enough pendant that will force you to ride at your almost maximum rate, and maintain it for 15-20 minutes. Doing this will help develop your lactic threshold and you will increase your maximum intensity output, which will help you maintain power on the pedals for longer periods of time. If you are planning to repeat the climbs in series every 10 minutes, remember to have a 5 minute cool down between them to allow you to perform at your maximum level at every interval. Just as training climbing is a positive input to your overall routine, training with intervals can benefit you in the same way. It is important to train at your maximum sprint level in 2 minutes blocks with 2 minutes light pedalling periods between them. These can be done in blocks of 10 cycles, which will improve your maximum V02 threshold, as well as maximum power output. Remember that before performing these training intervals, it is a must to correctly warm up beforehand, a minimum of 45 minutes of light pedalling and small 10-15 second sprints will properly warm up your muscles and allow you to get the maximum benefits out of this training method. Rest is fundamental. Rest days count as part of your training regime. If you do not rest enough, your body and muscles will not heal after an intense workout, nor will it be ready to take on another one. To add to this, overtraining your muscles can have an adverse effect on their growth, meaning a longer and less efficient training period. Depending on the intensity of the workout there will be days of total rest and other that we call active rest days, where you can perform light training, for example yoga, Pilates or just stretching, muscle relaxation and massages. Take full advantage of your rest days to disconnect completely from cycling, rest your mind as well as your muscles. During a race, it is very important to find a group that is riding at an average speed that is comfortable for you. Being in a group during a race if fundamental to not waste energy riding solo. This is also true during Gran Fondo races. Taking into account that there will be varying levels, the most important factor is to join a group that you feel comfortable riding with, is does not need to be a large group, just one that will not overwork you. Never leave a group while climbing or during long flat periods. If you do, it will be incredibly hard to rejoin and can ultimately make you lose too much energy doing so. 7.GRAN FONDO RACES ARE LONG; BE PATIENT. Specially at the start. Gran Fondo races are famous because from kilometre zero, racers start at a pace much higher than what will eventually be their average. Do not stress. Start at a good rhythm so you do not find yourself alone, but never at a pace that is above your correct average speed. You will only achieve tiring yourself out early, which will inevitably affect you later on in the race. Remember that this will be a long race, and you will have moments that you will ride at a quicker pace, if you feel you have extra energy to spare. It is better to save energy at the beginning, and use it at the end. Never forget to eat during training and racing. During training it will help you identify which food sources you digest the best. And during a race it will give you the energy needed to finish. If there is a type of energy bar, fruit or nutritional complement that works for you during training, use these during a race too. Whilst competing, the food they give out may make you feel bad, have stomach problems and force you to stop. You will also lose less time if you take food with you, as you will not have to stop as frequently as if you had none, making calculating the amount of stops easier, leading to a better final time. If you have time and can take an extra day off, it is important to be able to travel with a couple of days extra before the Gran Fondo race. You will be able to rest from the long trip there, check out the surrounding terrain, and see first hand which parts will need which clothing. If you are travelling to another country or continent, and will accumulate jet lag, it is important to travel with at least two days to spare, to acclimatise your body to the new time zone. If you can do it with 3-4 days to spare, even better. Another advantage to travelling with time to spare, is to be able to adjust your bike correctly, and check all the rest of your equipment. Your bike needs to be working 100% correctly on the day of the race. It is vital to check over and adjust your bike the week before a race, take it to your local mechanic to get it checked over completely. Remember to check the basics before a Gran Fondo race. All bolts need to be correctly torqued, tyre pressure checked, quick release levers and pedals tightened and your drivetrain correctly adjusted. Also check that your cleats and brake pads are positioned and tightened correctly. It is important to carry basic spare parts with you at all times, one or two inner tubes, C02 canisters and a multi tool would be the minimum. It is up to you if you wish to take more. You will also have to check which clothing you take, the weather conditions may change suddenly, rain, wind or a big drop in temperature can occur. Try not to carry too much kit, as it will be lot of time on your bike, a windbreaker and arm warmers are a must in colder weather or if the temperature drops during a mountain ascent.